The PICA syndrome is also known as "lateral medullary syndrome", or "Wallenberg's syndrome", after Wallenberg's description in 1895. This is the most common brainstem stroke. It is typified by vertigo, ipsilateral hemiataxia, dysarthria, ptosis and miosis. Most patients with this stroke recover very well and often resume their previous activities (Nelles et al, 1998). Patients often have a Horner's syndrome (unilateral ptosis, miosis and facial anhidrosis). Medullary infarct from left vertebral artery dissection (L dorsolateral medulla) associated with "contrapulsion". For vertical saccades upward or downward, eyes always move to the right, which is contralateral to the side of the stroke (on the left). This is contrapulsion (see below). We know it is not due to the head being tilted, because in that case, the eyes would not always go the same direction. There also may be saccadic dysmetria (overshoot), saccadic pulsion (pulling of the eye during vertical saccades toward the side of lesion -- called ipsipulsion). Rarely, the eyes go towards the opposite side of the lesion (called contrapulsion). (Kaski et al, 2012). Because the eyes can go either way, ipsi or contra, the localizing significance of pulsion is not teriffic. Prognosis is generally quite good with full or near full recovery expected at 6 months. Diagnosis is generally via MRI (see below). CT-angiography with 3D reconstruction has gotten good enough in recent years to be helpful too. ABR testing is often abnormal in persons with central Horner's syndrome (Faught and Oh, 1985), but as the lesion in Wallenberg syndrome is usually below the auditory connections, Horners due to Wallenbergs are not generally associated with abnormal ABR. 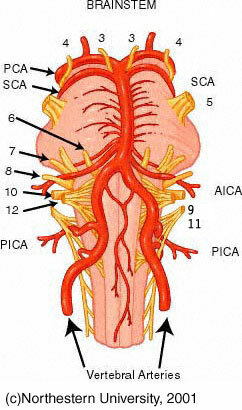 PICA may arise from the vertebral artery (the usual case), or as a separate branch of the basilar artery. Because of the far more common origin from the vertebral artery, most "PICA" syndrome strokes actually are due to vertebral artery occlusion (Kim 2003). Cardiac embolism causes only 5% of these strokes, while dissection causes 15% (Kim, 2003). PICA is the most common site of occlusion from propagating thrombus or embolism caused by injury to the third section of the vertebral artery, and Wallenberg's syndrome is the most common stroke caused by chiropractic manipulation (Caplan, 1986). Acute diffusion image of patient described below. 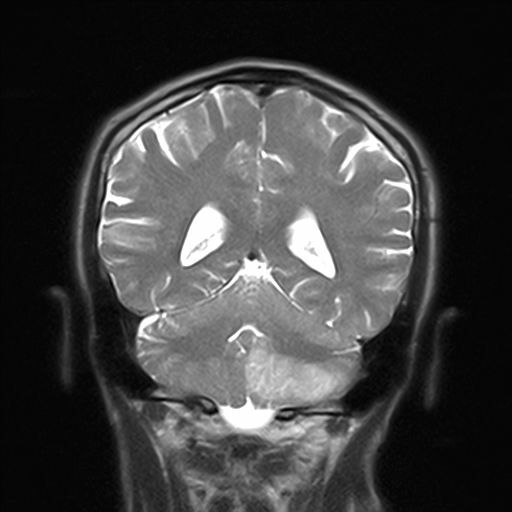 There is low blood flow on the right medulla (left side above) Reversal of spontaneous nystagmus from LB to RB on head-shaking in LMN syndrome. 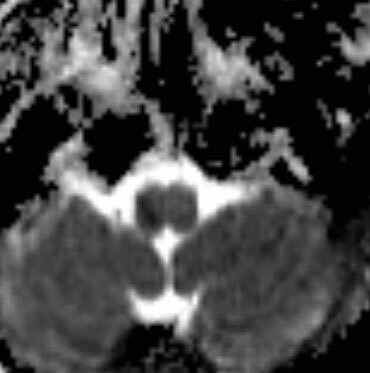 A man in his 50's developed dizziness after a brainstem stroke, experienced 2 months ago. The stroke was due to a cardiac arrhythmia, and at one point the vertebral artery on the right was blocked. When he was seen in the office, he was in a wheelchair, and his speech was hoarse. His right pupil was smaller but both reacted. There was no palatal myoclonus. Cerebellar examination was normal in the limbs. There was a strong left-beating gaze-evoked nystagmus, and also there was a right-torsional beating torsional nystagmus. Positional testing was abnormal due to the ongoing nystagmus, but there was also a brief upbeating nystagmus. Headshaking provoked a very strong reversal of nystagmus. Vestibular testing elicited normal VHIT, and rotatory chair testing had a normal gain/time-constant, but there was strong spontaneous nystagmus. On seeing him about 5 months later, he was walking without aid. He had a stronger right-torsional nystgmus, that became downbeating on lateral gaze, and became much larger after gaze-holding to the side and returning to the center (i.e. a rebound effect). There was still no palatal myoclonus. Cerebellar examination continued to be nearly normal, although a little better on the left (his nondominant side). The pupils remained smaller on the right. Comment: This is a nearly classic LMN (Wallenberg) syndrome from the general features, with a persistent torsional nystagmus, beating in a paradoxical (RT) direction. He also has a paradoxical direction of head-shaking nystagmus. There are strong influences of both gaze and gravity, but relatively little limb dysmetria. Kaski, D., et al. (2012). "Up-down asymmetry of saccadic contrapulsion in lateral medullary syndrome." J Neuroophthalmol 32(3): 224-226. Kim JS (2003). "Pure lateral medullary infarction: clinical-radiological correlation of 130 acute, consecutive patients." Brain 126(Pt 8): 1864-72. We thank Dr. Dusan Pavlocic for helping correct a reference on this page.